I have a weakness for cinnamon rolls. They are kind of up there with lattes and cake. Not quite there, but awfully darn close. Pretty much if a cinnamon roll comes through the door of our house, you better guard it, or it might disappear. I have had cinnamon rolls on my mind for weeks now. So, when I met a friend for coffee earlier this week and she brought a couple for me, I gave in. When it comes to baking, I usually wait until a craving hits and I stave it off for as long as possible before giving in. But, I couldn’t resist any longer and had to try my hand experimenting. Let me start by saying, I love butter and milk. LOVE. But of late, I have had so many friends with food intolerances that I have been trying to create recipes that avoid cow’s milk. These cinnamon rolls are hearty and gooey. They fill you up but don’t sink you (unless you have more than one). They are sweet, but not over the top. (Which if you want them even less sweet, omit or reduce the amount of icing you use.) One note of complete honesty though, I didn’t have enough powdered sugar on hand. Had I had more, I definitely would have made the icing more of a cream and less of a glaze. But, to each his own. Whatever you prefer. Add more powdered sugar until you have the consistency you want. And honestly, if you want it stiffer, you can whip it with a beater rather than by hand and even add some melted coconut oil too. Experiment. 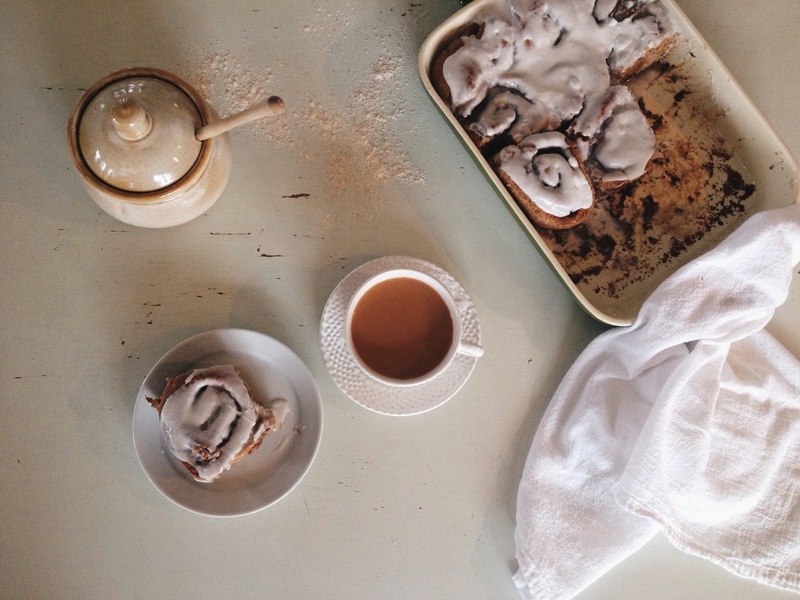 Come up with what you think tastes best; what you think makes the perfect cinnamon roll. And the nice thing about cinnamon rolls, you can start them at night and have them ready to eat in the morning. In a small saucepan melt the coconut oil over low heat. Add the coconut milk and warm gently. Add the honey and continue to heat gentle until warmed. Remove from heat and add the yeast to the wet ingredients and whisk to combine. Stir into the flour mixture with a wooden spoon. Work the dough together, kneading in the reserved flour as needed until you have a manageable, soft dough that is no longer sticking. You should still have about a 1/4 cup remaining. Cover with a moist towel and let rise in a warm place for two hours. Once the dough has had time to rise, sprinkle the remaining flour on your clean work surface and form into a rectangle, about a 1/2″ thick. In a bowl, combine the sucanat, walnuts, cinnamon, and salt. Spread the coconut butter evenly across the dough. Sprinkle the filling mixture evenly over the dough, leaving a slight border around the edges (1/2″ to 1″). Now, here comes the really only slightly difficult part. Gently, yet tightly, roll the dough into a log (rolling in from one of the long sides). The dough will be soft so try to make sure to get as tight a roll as possible. Now, seal the dough and place the seam side down. Using a sharp knife, cut the dough into 1″-1 1/2″ pieces. Carefully place the rolls into a 9″ x 13″ baking dish. Some of the sucanat is sure to escape. Don’t worry. As you transfer the pieces to the baking dish, scoop up any lost sucanat and scatter along the bottom of the baking dish before placing the cinnamon roll. This only helps the end result. You know the best part of a cinnamon roll? The cinnamon that gets trapped on the bottom and caramelizes? Yep…this just makes the bottoms even more gooey and caramelized. Try to fit the cinnamon rolls as tightly together as possible so to help them maintain their shape while cooking. You might have some space at the end of the baking dish, but don’t worry. It will be fine. If anything, you can cut the rolls at 1″ to try to get 15 instead of 12 and fill up the dish. Now, cover with the towel and allow to rise for another hour. At this point, I say put them in the fridge and go to bed and patiently wait until the morning. Or if you are ready to bake them, go ahead. If you put them in the fridge, make sure you allow them to come to room temperature before baking. Heat oven while the rolls are rising or returning to room temperature to 350 degrees. Place in the middle rack of the oven and bake for 25-30 minutes (checking after 20 minutes). Bake until they are beginning to brown and color. To test, tap them and make sure they feel set and cooked through. But be mindful, they will still have some give and be soft. Remove from oven and let cool completely. 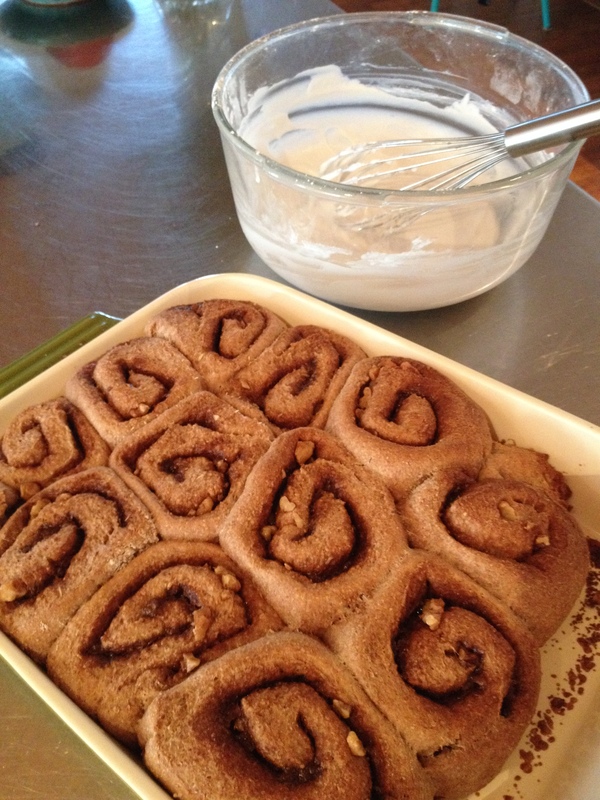 While the cinnamon rolls are cooling, make your icing. Open the can of coconut milk and pour out the liquid, scraping the solids into a bowl. So, some of you might be familiar with a little trick to aid in separating the solid from the liquid. If you put your can of coconut milk in the fridge over night, it helps separate them. If you don’t, it should not be an issue. However, if your can is not separated, you are going to have to use cheesecloth and strain the liquid. Here comes the decision part. You can whip with a beater until light and fluffy and then slowly adding the sugar or you can simply whisk together the ingredients by hand for a glaze. 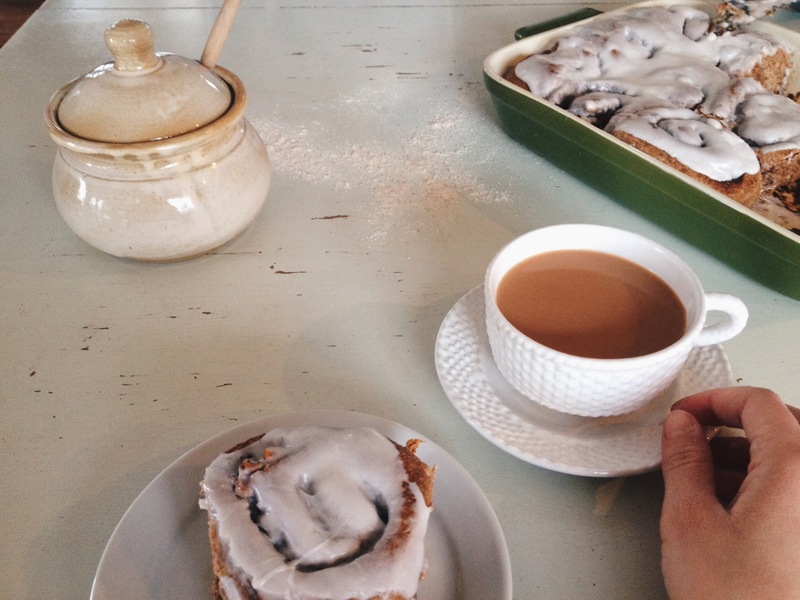 Frost the cinnamon rolls and enjoy!